I'd like you to meet Penny Boswinkle. She's one of the talented stitchers from The Nimble Needle - Atlanta. 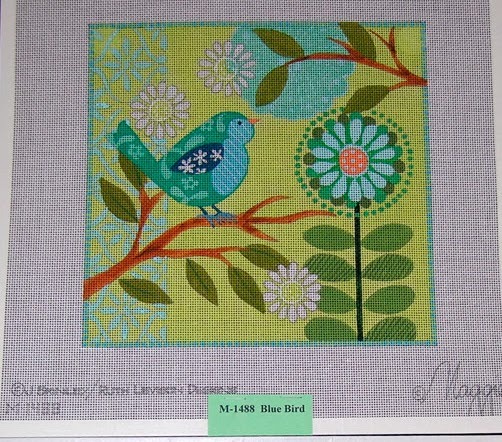 Penny attended the April 2013 canvas enhancement class and selected the Blue Bird (canvas by Maggie Co. M-1488). I was smitten with this canvas when I saw it at the TNNA Market, and was pleased to give some stitch suggestions for it. Little did I know when I signed up for Robin King’s April 7th Canvas Enhancement Class at The Nimble Needle in Atlanta what a fun journey with an exciting end I was about to start. I picked Maggie Co’s Blue Bird for my first Robin stitch guide. Before the class we had to get two color copies of our piece – one for Stacy Brown (the shop owner) to send to Robin and the second one for us to use for notes during class. Stacy had set the class up so that each of us had our own time with Robin. Class started at 9am and my time was 11am. Not wanting to miss a thing I was there at 9 to find my stitch guide waiting so that I could pick threads before I talked with Robin. When it was time, we discussed each section and the suggested threads – most of the areas stayed the same as her original idea, but we did change a few. Stacy provided a wonderful lunch and then back to work we went. As soon as Robin had given everyone their assigned time, she was around the room answering questions and giving advice. We even had a cupcake break! All in all it was a wonderful class and day! I was really thrilled with my stitch guide and couldn’t seem to put the piece down at home. As the piece progressed there were a few places I made some changes, but not many. Packed outline for the tree; lazy daisy stitch with a center straight stitch for the flowers; padded satin for the bird’s wing with clear star beads scattered on it; bullions for the bird’s feet; stump work for the center of the largest flower – no wonder I couldn’t quit stitching. When I finished, my framer suggested a plain copper tone frame that blended with the trees. I was thrill with the way it turned out; so decided to enter it in the ANG National Seminar Exhibit in Anaheim. Imagine how thrilled I was when the Exhibit opened and I found my piece had won an honorable mention ribbon! I’ve won ribbons before, but don’t think any piece had been stitched with such a fun journey! If any of you get the chance to take a class with Robin, DO IT! 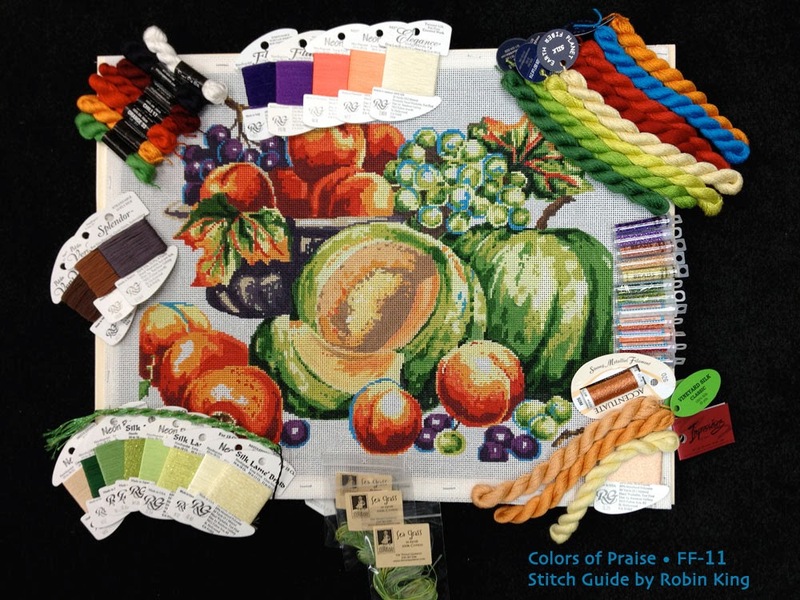 In fact, I will be in Robin’s next class at The Nimble Needle and can’t wait to see what happens with that piece! What nice words. Thanks, Penny. Here is the Blue Bird all finished and framed. Such a sweet piece. Great job, Penny. 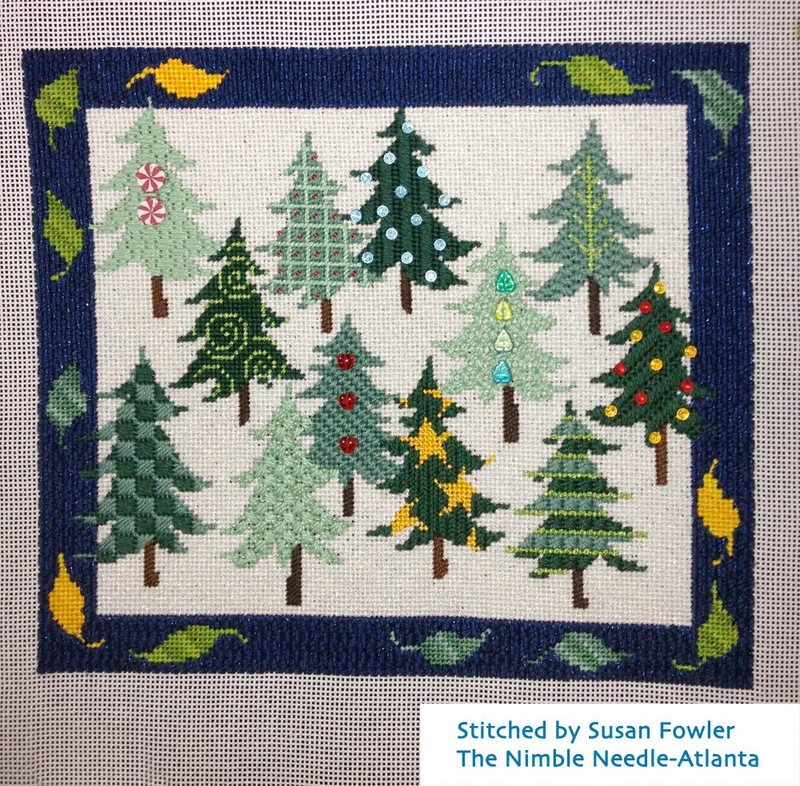 In October 2013, I returned to The Nimble Needle - Atlanta for another group of canvas enhancement classes. Penny returned, too... this time with Approaching the Skies by Quail Run Designs (QR-020A). 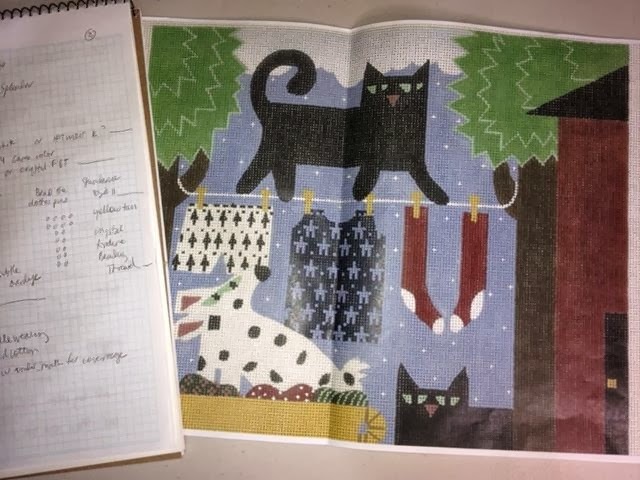 When I was coming up with stitches, I was feeling a decorative, light approach to the different color blocks. I shared my thoughts with Penny and she was on board with the plan. Here is one of the stitches we used. Isn't it pretty? 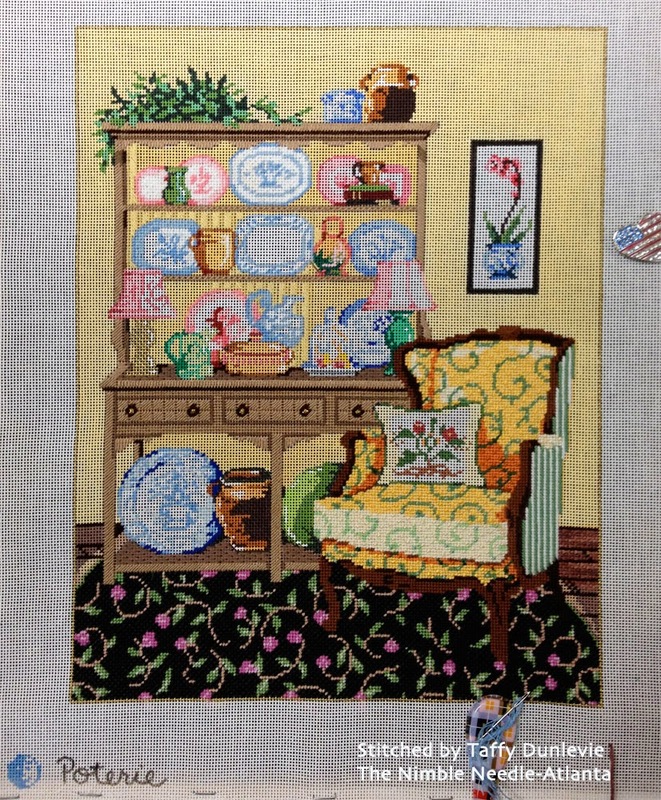 As you might have guessed, Penny has already finished stitching this piece! I know what you are thinking... she is a stitching machine. Penny sent me a photo, and said it will be framed by the next time I'm in ATL... which is next weekend. I can't wait to see it, and Penny, too. 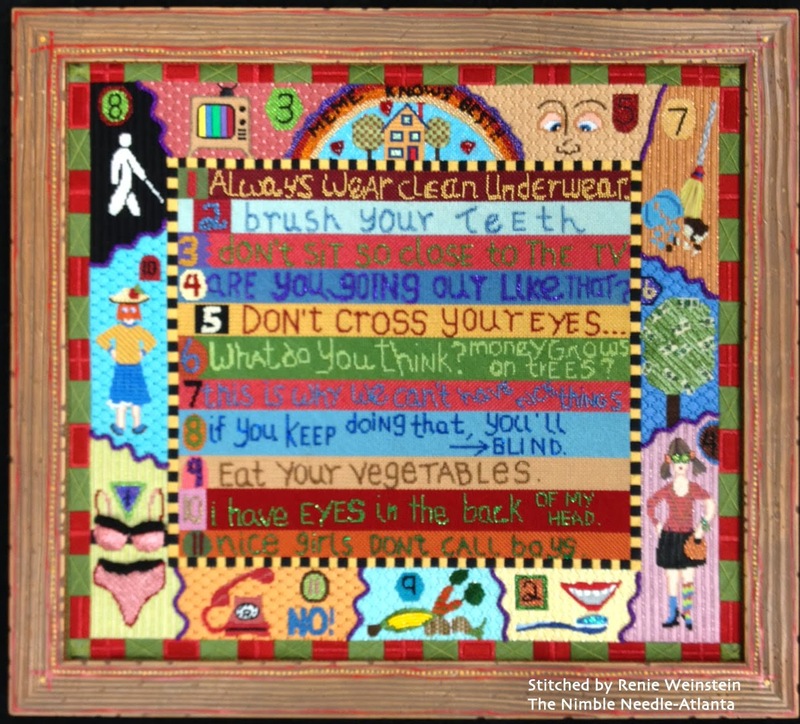 Like clockwork, I am returning to The Nimble Needle - Atlanta for another session of canvas enhancement classes. Penny will be there, too. Here's what she has selected: Because You're Mine I Walk the Line. Canvas by Quail Run Designs, artist Nancy Coffelt (NC112). Two cats and one dog amongst a scene of laundry. How cute is this canvas!!! Next blog... I will showcase the canvases selected for the upcoming Enhancement classes at The Nimble Needle - Atlanta... a delightful assortment of designs. It is always thrilling to see one's stitch suggestions come to life. In April 2013, I taught some canvas enhancement classes at The Nimble Needle-Atlanta, and in October 2013 I returned and taught some more canvas enhancement classes. To my surprise, several of the October class students had been in the April class, and they brought in their finished/almost finished pieces to show and tell. 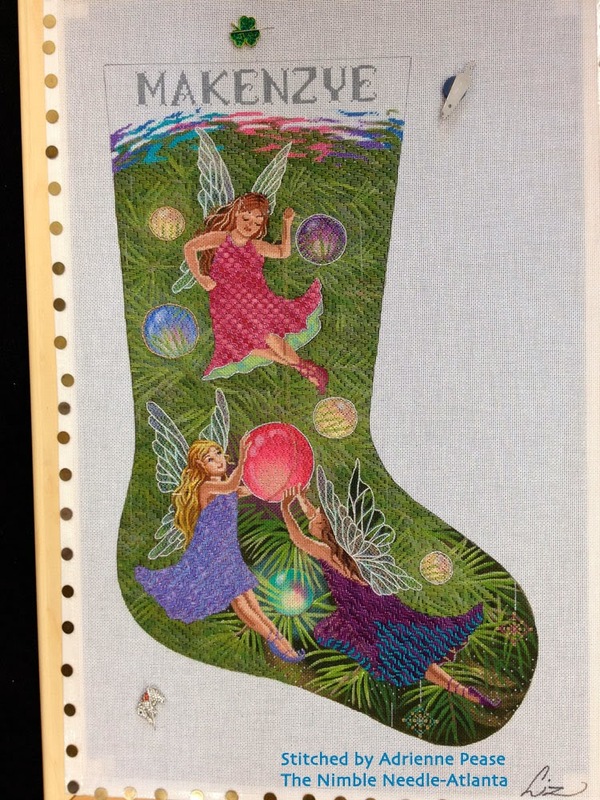 First up: Christmas Fairies Large Stocking stitched by Adrienne Pease. 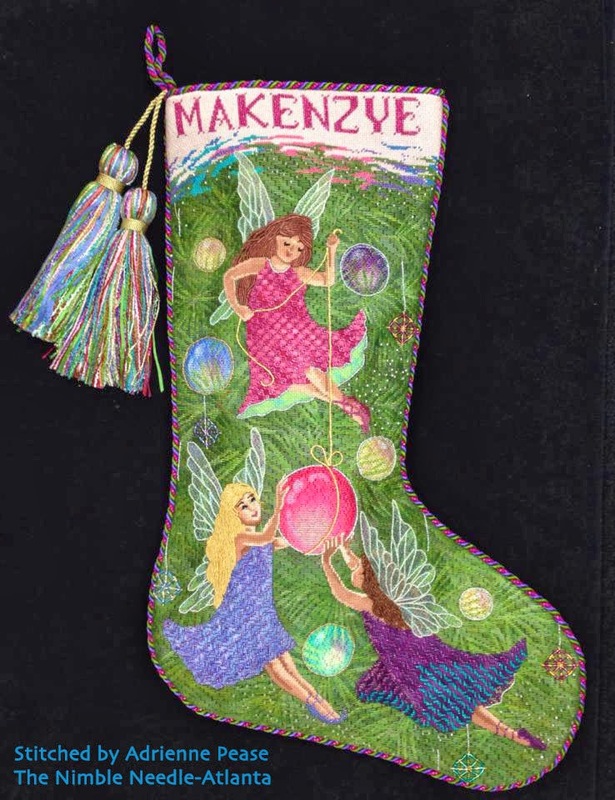 This stocking (canvas by Susan Roberts/Tapestry Tent • TTAXS336) is for one of Adrienne's granddaughters. Lucky girl. 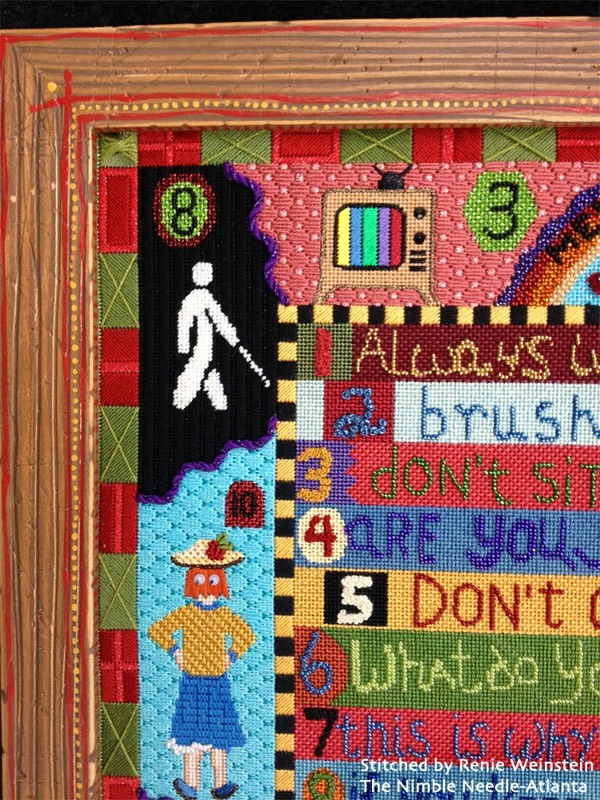 Next up: Mom Knows Best stitched by Renie Weinstein. These "Rules" came to life and Renie did a wonderful job. Canvas by Maggie Co. • M-1587 • artist, Lisa Krause. Next up: Twelve Canadian Evergreen Trees stitched by Susan Fowler. 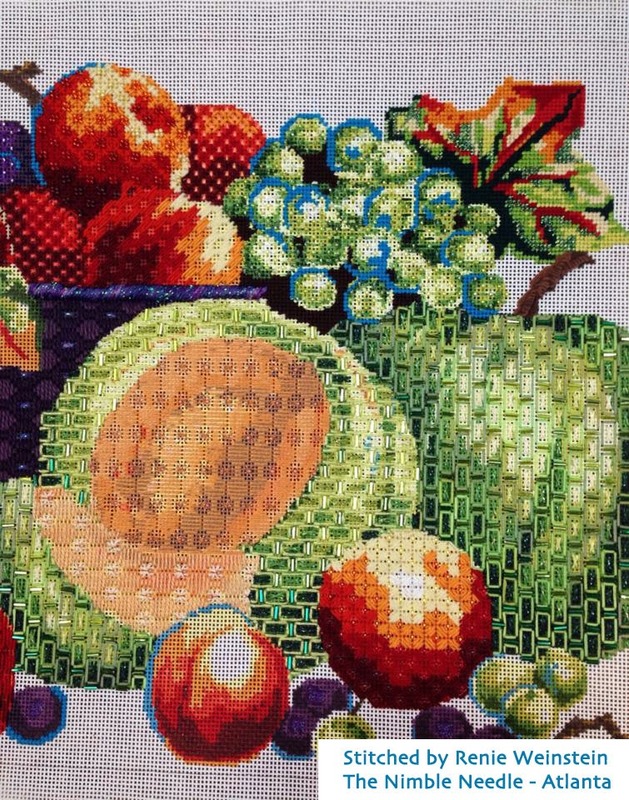 This delightful Pippin canvas is on 12 mesh. Great job, Susan. Next up: Poterie stitched by Taffy Dunlevie. 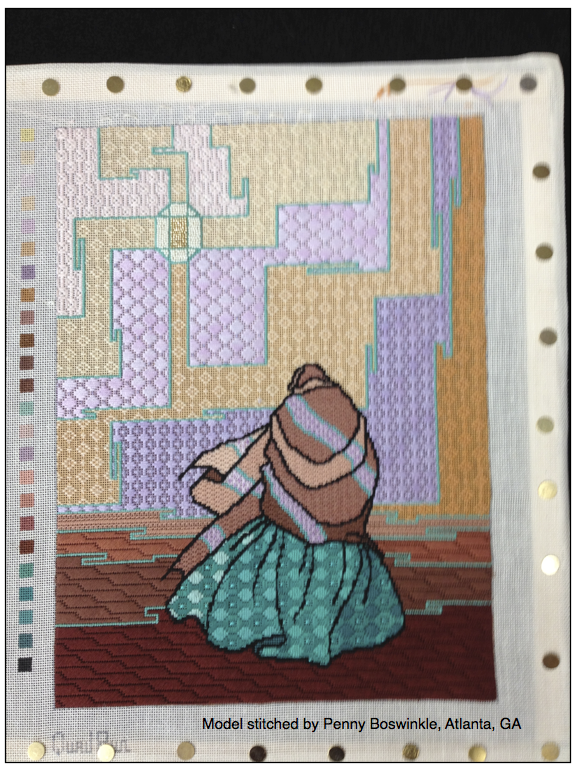 Taffy is stitching this Sandra Gilmore design (canvas by Once in a Blue Moon • SG-18-860) and showed me her progress. I was very pleased! 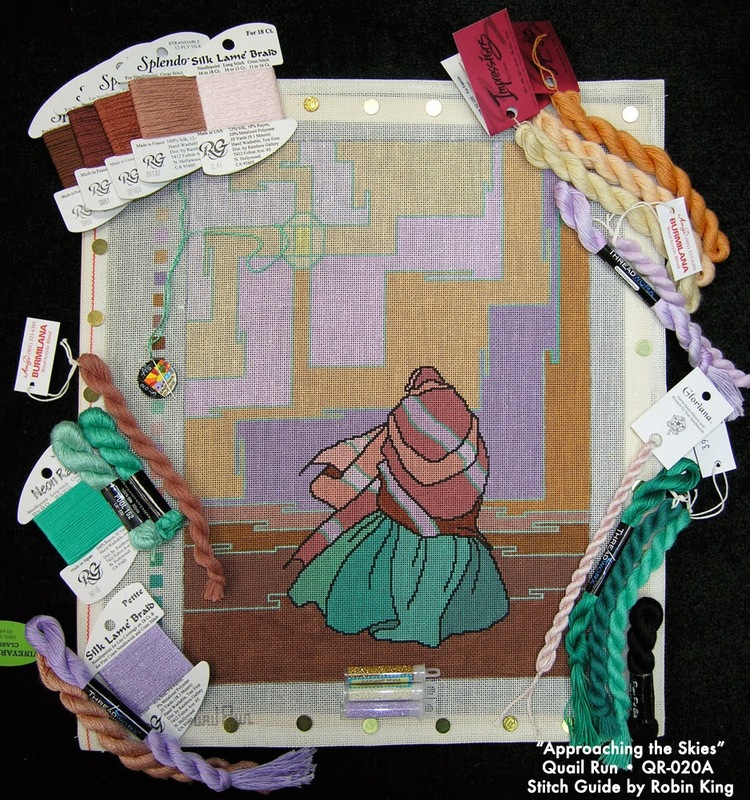 The stitchers from the October 2013 enhancement classes at The Nimble Needle - Atlanta have shown just as much stitching progress. 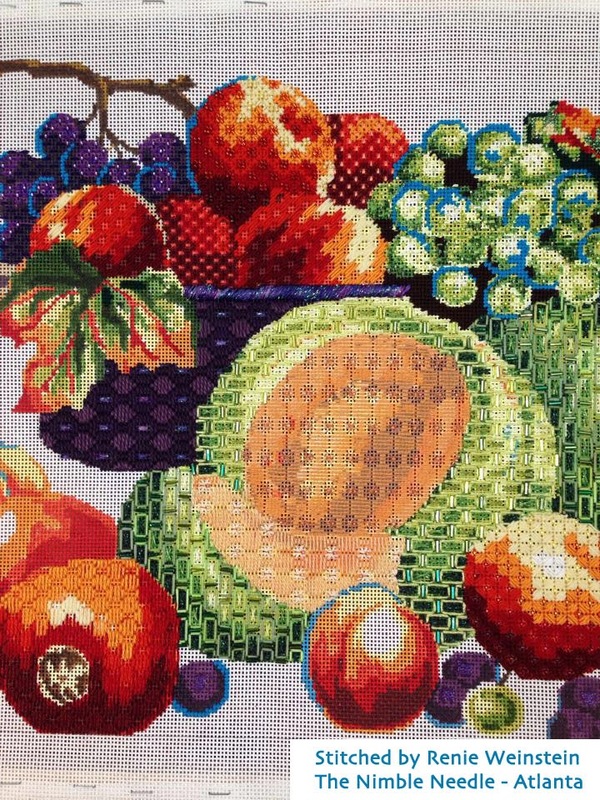 Renie Weinstein is almost finished with her Melons & Peaches canvas by Colors of Praise (FF-11). Last one to mention in this blog posting: Slippers by Colors of Praise (MC-226). 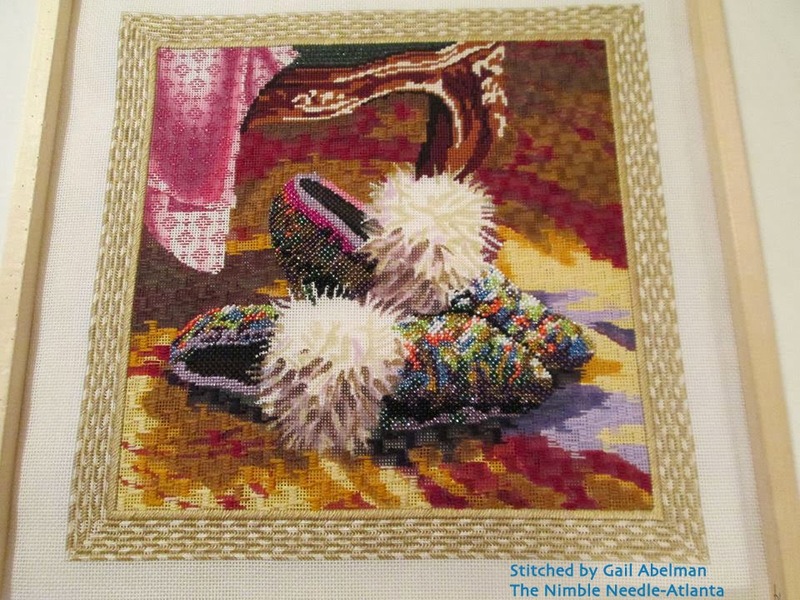 Gail Abelman is stitching this piece and has shared her progress. All I could say is WOW. I am very pleased. I'll be returning to The Nimble Needle - Atlanta next week (February 8-10, 2014) for another session of canvas enhancement classes. Can't wait to see everyone and to begin this journey again. 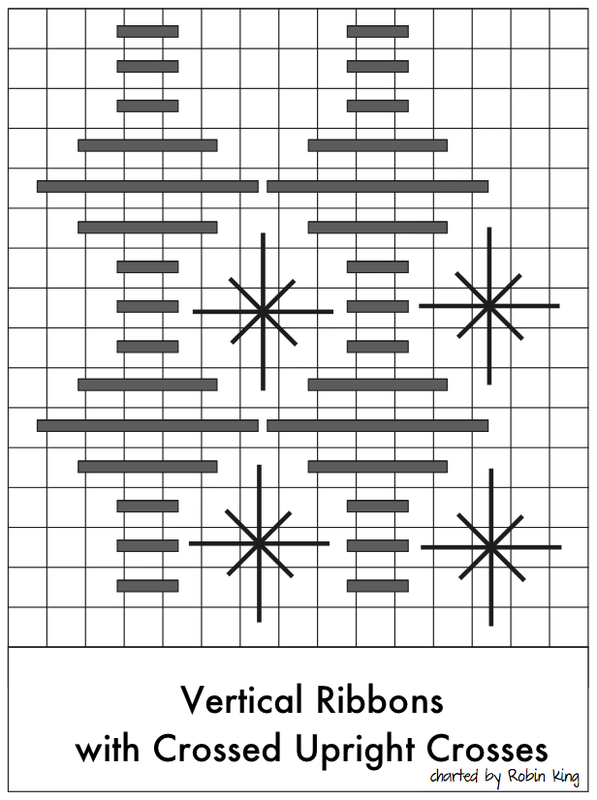 Any/all of my stitch guides are available... you can email me at creativecats@comcast.net. 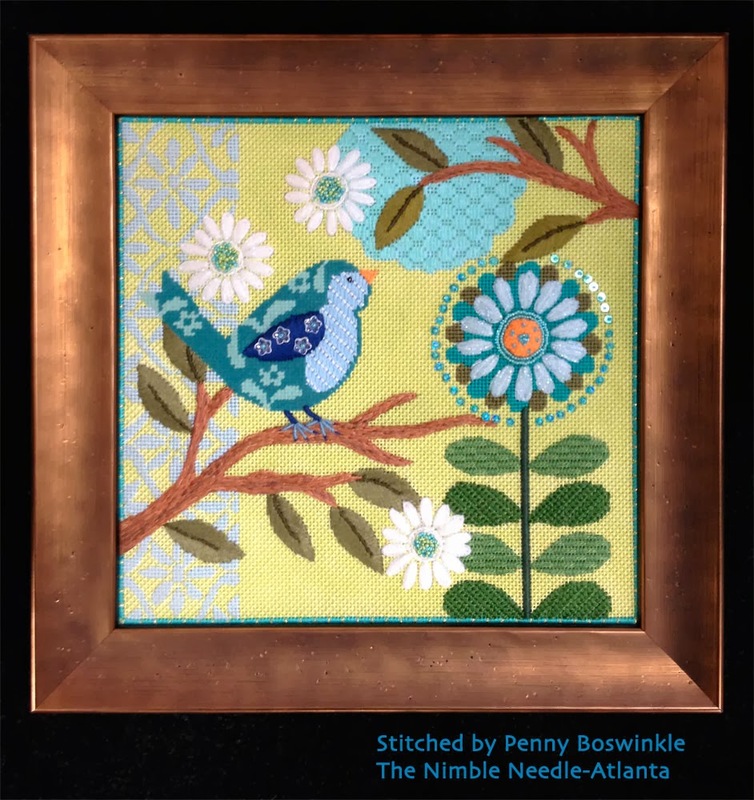 In the next blog, I will share some finished pieces from another talented stitcher at The Nimble Needle - Atlanta, Penny Boswinkle. I'm going to start writing it now... look for it tomorrow.